In high school, my brother Jay started talking about the Super Delicious everything in them but the kitchen sink, absolutely wonderful cookies he ate at work. .Jay did farm work, working hard and long hours, eating with the family to save time. These delicious cookies were a specialty of the lady of the house and Jay would come home raving over them every time they appeared. Super delicious! Best darn cookies ever made, he declared. The recipe eventually made it home and was tried with great expectation. Jay was right! Crunchy, crispy but not hard. Every fabulous flavor we all liked. Thick and kind of chewy. Super delicious! Best darn cookies ever! I’ve made them to rave reviews ever since. Bytes and his brother loved them; so did Wheels. Cookie exchange hosts asked for them. They make a great addition to a Christmas cookie tray. Or to a bake sale table. Don’t let the long list of ingredients fool you. These are quick and easy to make, too. Would a busy farm wife make them if they weren’t? I gather up all the ingredients on the counter before starting. I measure, add and put away the ingredient packages as I go, so I don’t risk forgetting something. The original recipe called for cup of brown sugar, but reducing by a quarter of a cup still gives flavor and allows the cookie to still brown nicely. Cream of tartar is a by product of winemaking – the sediment left in the barrel following fermentation. It’s acidity works with baking soda to cause the cookie to rise and to prevent sugar from crystalizing. It’s a bit unusual to call for cream of tartar in a modern cookie recipe, but essential for this one. Baking powder is already a mixture of soda and cream of tartar activated by the moisture of the batter or dough. I don’t know why this recipe calls for soda and cream of tartar and not baking powder – but decided not to mess with success! I often use parchment paper for baking cookies to keep them from sticking to the cookie sheet, but these don’t need that because of the oil. They can be a bit tender and break apart while hot, so if you have trouble moving cookies to the cooling rack, parchment paper can be lifted off with the cookies still on it. Remove cookies from paper when cool. 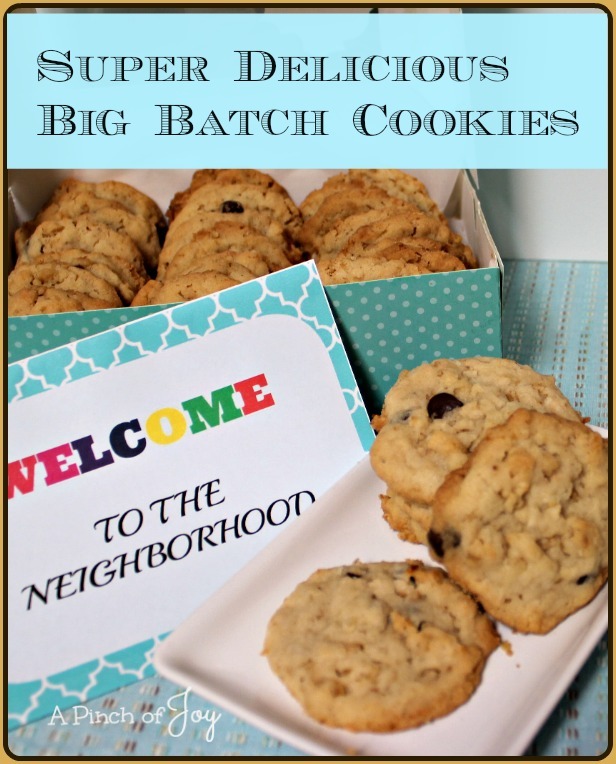 These also make great gifts to welcome new folks to the neighborhood! I’m looking forward to meeting the new neighbors across the street that have worked magic with the big yard and house before moving in even! I’ll hand them a box of Super Delicious Cookies and a welcome note from the neighborhood association. A unique crispy shortbread type cookie textured with oatmeal, coconut and chocolate chips. Super delicious treat that everyone loves! In large mixer bowl, blend butter/margarine, oil and sugars until there are no lumps. Measure 1 cup of flour and add to mixture, blending well. Measure second cup of flour, and soda, salt and cream of tartar and mix well again. Add remaining flour, coconut and oatmeal and mix well. Stir in crisp rice cereal and chocolate chips. Bake on ungreased and/or parchment paper lined cookie sheet for 10-12 minutes, until set and golden brown on around the edges of the cookies. Let cool about 10 minutes before removing to cooling rack. I’m so glad you stopped by today! Follow A Pinch of Joy using the icons on the teal bar at the top of the page so you don’t miss a thing! I’d love to have your company on this venture!! Share: if you found this helpful or inspiring please click one of the buttons below! Please pin!! Your support of A Pinch of Joy is appreciated! Thank you so much for sharing your delicious recipe on a recent edition of Saturday Spotlight on Angels Homestead! A Big Batch Cookie is sure what I need for the coward that we have coming for Thanksgiving. Thanks so much for sharing your great recipe with Full Plate Thursday and enjoy your Thanksgiving week! These look so scrumptious! Thank you for the recipe!